The interpretation of the Ishihara test for color blindness is very helpful for finding the degree of color blindness a person is experiencing. It also helps to decide if color blindness could interfere with a person’s ability to do certain tasks. The Ishihara test helps to discover the congenital form of red and green color deficiencies. There is a separate test for those rare patients that have the yellow and blue deficiency. When interpreting the Ishihara test for color blindness, results should be based on correct responses to the seventeen plates used in the test. Fourteen of these plates screen with accuracy for red and green deficiency. One plate estimates the type and degree of the deficiency. Two plates screen for yellow and blue deficiency, which occurs only in a very small percentage of the population. However, a separate test is also available to test more accurately for the rarer yellow and blue deficiency. Plates two through eleven are for testing color defects. Plates twelve through fourteen are used for those with a red and green color deficiency. Red and green deficiencies occur with the most frequency and red deficiency is known as protanopia while green deficiency is known as deuteranopia. 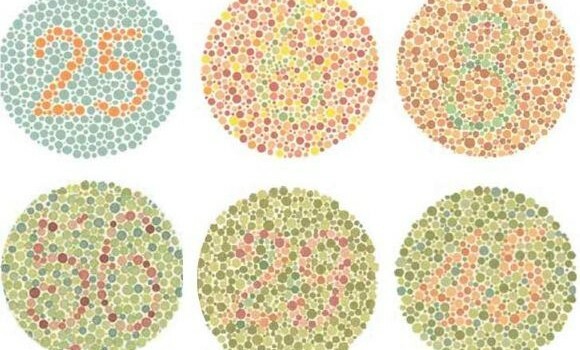 Color blindness can affect people to different degrees, therefore it is important to consider the number of incorrect responses to the test when determining how severe the person’s deficiency is. When a person is tested using the Ishihara test, a score of ten correct answers out of eleven is considered to be within the normal range. A score of seven or less out of eleven is abnormal, and the person would be considered to have this deficiency of the ability to correctly see colors. If the score is either eight or nine out of a possible eleven correct answers, further testing will be needed to find if the person is truly exhibiting red green deficient tendencies. Color blindness can cause problems for people in certain occupations. It is imperative to interpret results of the Ishihara test correctly so the person is aware if they do show color deficiency tendencies.